One of the greatest gifts that Islam has provided to human civilization is the acknowledgement of humans as dignified beings, to even a higher position than the angels. Through this metaphysical foundation, human beings particularly the God-conscious are living a path of liberation from any forms of unjust authorities, hegemonic indoctrination, and nonsensical superstitious beliefs. This divine recognition of human dignity, which comes along with the responsibility as the vicegerent on earth could never have been acknowledged without some special rights, among them, the freedom of conscience. However, after several centuries since its divine revelation, the ideals and principles of Islam have turned into official laws and rulings, its spirit of solidarity has transformed into socio-political entities, and God’s metaphysical authority has been taken over by the rule of contesting dynasties, absolute monarchies, and in the more recent times, by modern-state institutions. To some point, it seems as if the foundation of religion has changed from individual faith through conscience into a collective submission through forced conviction. In such settings of current Muslim societies, several important questions must be raised: Is Islam a religion of liberation or of compulsion? Are there any rights to freedom of religion for Muslims? 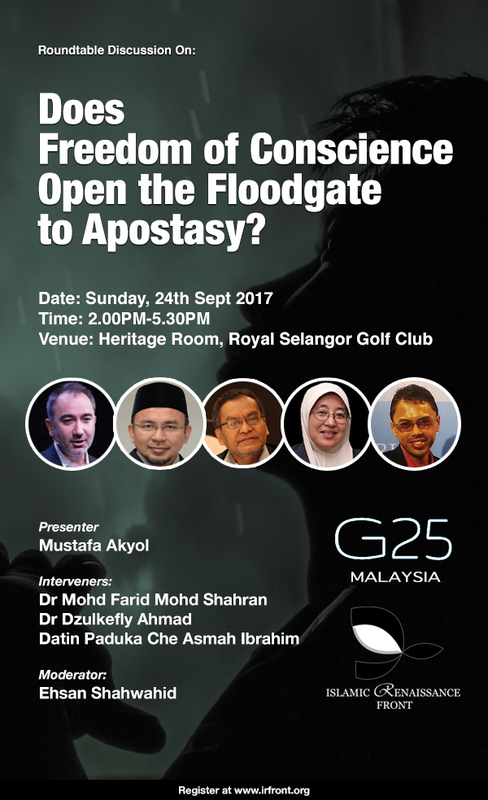 And furthermore, could freedom of conscience actually open the flood-gate to apostasy? Reflecting on these questions, and many other related issues to Freedom of Conscience and Islam, this roundtable discussion on “Does Freedom of Conscience Open the Floodgate to Apostasy?” shall serve as a platform to discuss the topic further, in a good faith towards a common benefit for the Malay-Muslims and the multicultural and multi-religious communities at large. Mustafa Akyol is a Turkish journalist and author. He studied political science and history at Bogazici University. For more than a decade, he has been writing regular opinion columns for Turkish publications like Hurriyet Daily News, and recently for the Middle-East focused Al-Monitor.com. Since fall 2013, he is also a regular contributing opinion writer for The International New York Times. He has published six books in Turkish, including “Rethinking the Kurdish Question: What Went Wrong, What Next?” (2005). His 2011 book, “Islam Without Extremes: A Muslim Case for Liberty” an argument for Islamic liberalism, was published in the W.W. Norton. The book was long-listed for the Lionel Gelber Prize, a literary prize awarded by the University of Toronto for the best nonfiction book in English that seeks to deepen public debate on significant international issues, and praised by The Financial Times as “a forthright and elegant Muslim defense of freedom.” In Feb 2017, another book by Mr. Akyol, “The Islamic Jesus: How the King of the Jews Became a Prophet of the Muslims” was published by St. Martins Press. Mr. Akyol is also a public speaker who has given hundreds of lectures and talks on numerous platforms, including TED, where he spoke on “Faith vs. Tradition in Islam.” He has also been a commentator on public affairs programs, including the BBC’s “Hardtalk” and CNN’s “Fareed Zakaria GPS.” Since Jan 2017, Mr. Akyol is a Senior Visiting Fellow at the Freedom Project at Wellesley College, based in Massachusetts, USA. Dr Mohd Farid Mohd Shahran is currently a Senior Fellow and Director, Centre of the Study of Shariah, Laws and Politics, Institute of Islamic Understanding Malaysia (IKIM). He obtained his Bachelor Degree from the International Islamic University Malaysia (IIUM) in the field of Islamic Studies with a specialization in Islamic Jurisprudence and Principle of Islamic Jurisprudence. He then pursued his M.A. and Ph.D. in the International Institute of Islamic Thought and Civilization Malaysia (ISTAC) in the field of Islamic Thought in 1999 and 2006 respectively. He worked as a Research Fellow in ISTAC for eight years (1995-2003) before he served as a lecturer in Department of Usuluddin and Comparative Religion, Kulliyyah of Islamic Revealed Knowledge and Heritage, IIUM from 2003-2011. His areas of interest are Islamic Thought, Islamic Civilization and Education. Among his academic writings are Issues in Islamic Thought (2008), “Divine Transcendence and the Issue of Anthropomorphism,” in Islamic Revealed Knowledge: Dimensions of Thought (2011) and “Religion and the Challenge of Ethical Subjectivism” in Journal of AFKAR, University of Malaya. His books include Isu-Isu dalam Pemikiran Islam (2008) dan Manhaj Pendidikan Gerakan Islam (2009), Akidah dan Pemikiran Islam: Isu dan Cabaran (2013), Pluralisme Agama: Satu Penelitian Islami (2014) and Guru Cemerlang Pendidikan Islam (2016). Datin Paduka Che Asmah Ibrahim is the Head of the Women’s Wing of Pertubuhan Ikram Malaysia (IKRAM). Being a retired civil servant, she brings with her 28 years of working experiences in environmental management specialising in the area of air pollution; waste and hazardous waste management; environmental legal requirements and policies; and environmental governance. She is also passionate for humanitarian and social work and had participated in missions to Gaza, Palestine in 2012 and to Jordan in 2014 for the Syrian humanitarian mission. In addition, she is also being entrusted as one of the trustees at the Hidayah Centre Foundation, which caters for new Muslim reverts’ development. In 2010, she was bestowed with Datin Paduka Mahkota Selangor (DPMS) by HRH The Sultan of Selangor, in appreciation for her contribution particularly concerning the Selangor state’s environmental management when leading the DOE’s Selangor State office as a State’s Office Director.